Should I be a Bigger Person? In over two years of posting, I’ve only had one truly nasty and hurtful comment on my blog. It disparaged my son and it was signed ‘Anonymous’. It was also from someone I considered a friend. In actuality, we were husband friends. The kind who hang out because our wives are birds of a feather, beautiful and kind souls who share a wonderful outlook on life. This husband friend and I, however, are different kinds of people. Me more quiet and reserved, and he larger than life. Had it not been for the friendship our wives shared, we would most likely not have run in the same circles. But we hung out together on several occasions as couples. Then several months ago our families spent a weekend away together. It didn’t go well. Sleep was at a premium for everyone, especially the kids, and by the third day Lukas, who had not yet turned 2, had an altercation with this couples son who was a few months older. It wasn't pretty, but they were sleep deprived 2-year-olds and it was handled appropriately. Nothing more was mentioned at the time. Then, out of the blue, came the comment a few weeks later. Again, it was nasty and hurtful and led to a heated email exchange between myself and the husband. I was angry and was finished with this person, period. And I certainly didn’t want him anywhere near my son. Since then, including just a few days ago, we have had a few invitations from this family to get together. For an afternoon, or dinner, it didn’t matter, we have always been busy. I do appreciate the overtures from them move on, but the truth is I am just not ready to continue a relationship with the husband, no matter how good of friends our wives are. I have thought a lot about this. Should I put this incident behind me? Should I be a bigger person? Would resuming this relationship make me a bigger person? To this day however, I have not been able to put this behind me. My protective parent instincts just won't allow me to. I feel this is my prerogative as a parent of a young child. Thankfully, my wife agrees with me on this one. What do you say readers. Am I being too harsh? Or just a protective parent? Though he does not understand what is going on now, should I be teaching Lukas the lesson of forgiveness and second chances, or alternatively that the choice of who you feel comfortable associating with is a uniquely personal one? I'd be interested in hearing your feedback. This post brought to you by Dad-Blogs' FatherHood Friday. Be sure to swing by for all the other great Dads and Moms who love to share their lives online! Uh, whoever it was here in the Pacific Northwest who struck the deal with Lucifer hastening the early spring February weather - complete with sunshine, warm temperatures, and flowers in full bloom - my heartfelt thanks for sacrificing your soul so that my sanity can be preserved. Why do smoke alarms only seem to beep loudly and pronounce 'LOW BATTERY' in the wee hours (4:41 AM) of the morning? Just happened to me again last night. Every once in a while, I toy with the idea of growing a beard. I usually don't get beyond the scruff stage before either I, or more often Mrs. LIAYF, decide that it is time for the prickly growth to be mowed off. Recently, I have opted not to shave on the weekends to give my face a break and well, just because it feels more manly. But last night, while rocking Lukas in the dark before putting him in his crib, he rubbed his face against mine and broke out laughing. "I like your whiskers" he proclaimed. "You do?" "Yeah, they're adorable daddy!" Hmmm...I wasn't shooting for adorable with the beard, but I'm not one to pass up a compliment. A few nights ago Lukas woke with a frightened cry at 4:00AM. I hopped up and rushed in to find him sitting up weeping. I asked what was wrong and he responded with a scared voice "A funny man is dancing around in my room". I have to admit that the skin on my head immediately crawled and I had to look over both shoulders, before telling him it was just a bad dream and that it was ok to go back to sleep. I have been taking the bus to work since we sold our second car about a month ago. For weeks leading up to doing so, I have to admit I dreaded the thought. However, I have actually found it to be rather refreshing. I have been able to listen to lots of great podcasts and a ton of great music on the way. Music which I would have otherwise not have played at home or at work. Plus, rather than catch a transfer from downtown to my work, I have been walking the 12 blocks, uphill. I get a great workout, and some much needed fresh air. And finally, team LIAYF was extremely excited this week to learn of the birth of one of the Internets most highly anticipated bundles of joy. 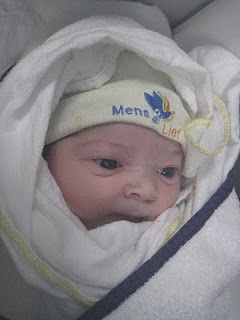 Congratulations to Martin over at Xbox4NappyRash and his wife ET on the birth of their beautiful daughter Sanne. Martin blogged with amazing humor and grace for many long months about the couples struggles with infertility. Having experienced first hand several long years of similar problems of our own, Mrs. LIAYF and I couldn't be happier for Martin and his family. Yes, the months ahead for them will be filled with many struggles, but they will also posses more sublime moments than they could ever imagine. If you could, take a moment to head over and congratulate them. I guarantee, it'll make you feel good. Feel like going random? Head on over to Keelys and join in the fun. It occurred to me the other day that, for the most part, I blog Old School. I'm just a dad who gushes endlessly about raising his son, and about all the enrichment that it has brought to his meager life. I wonder sometimes though, if this is enough to maintain a readership much less grow it. Currently, you don't see any advertisements here on LIAYF. I don't do review posts (mainly because no one has ever asked me to review any of their products). And I'm not writing a book that I want you to buy (well, not yet anyway). So, in an experiment aimed at increasing this blogs appeal to a wider audience, I decided to create a promotional film for Luke, I am Your Father. It turned out dull and boring, just like most of the content I throw out here, so I decided to scrap it and start from scratch, adding a few Hollywood touches. 2. A handsome leading man. 3. A brilliantly executed heist. 4. An exciting chase scene. Now, all I need is to convert this film to 3D and add a soundtrack laden with songs by edgy alternative rock groups, and this blog should go viral in no time. There are extremely few opportunities in life that one can look back upon, point to, and say to themselves (and others if you are the name dropping type), "I was there at that moment when the magic happened. I was there at the inception of something special. Something life altering, man!" For example, imagine being there when a young Kurt Kobain picked up his first electric guitar. When Neil Armstrong first gazed up at the Moon on a clear Summer evening. When Picasso first slapped paint onto a canvas. Or when a young Stephen King first spied his first big greasy spider. Special moments indeed. Even if you could have experienced these events with only one small degree of separation, shortly after they took place, you might consider yourself extremely lucky. The stories you could tell the Grandkids would be priceless. "I saw elephants in that house!" "Elephants - in that house?" "Yeah. And, they were wearing clothes!" "Really? What color were the elephants?" "Purple. I saw them last week." "That's amazing, Lukas. You saw dancing purple elephants in that house last week, and they were wearing clothes!" "Yeah! I made that up!!" You see, purple Dinosaurs are pictured under Lame in the dictionary. But dancing purple clothed elephants? You don't get any cooler than that! You can't teach that kind of creativity to a 2 year old. It simply takes you by surprise once or twice every generation. Soak it in readers. Turn off all outside noise-television, radio - and just let this moment in time ooze on down to your core. Feels good, doesn't it? Just don't forget to also mention Seattledad to your Grandkids when telling them you were one of the first to read one of Lukas' stories. 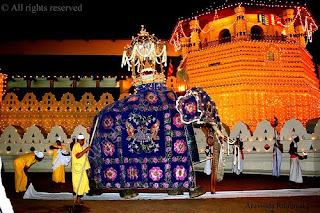 *Photo by Aravinda Rathnayake of Sri Lankan Esala Perahera Festival. Do you think Charles Darwin spent his evenings slumped over a sink full of dirty pots and pans, scrubbing out caked-on egg residue? Can you imagine him spending his free time washing and folding multiple loads of laundry on any given weekend? Is it likely that this most iconic figure of 19th century science actually changed many of his kids dirty diapers? Or rocked them to sleep on a particularly rough night, while making up songs about bumbling firemen, talking trains, or sofa eating sheep? I have this theory that over the years (accelerating exponentially in the past 25) women, as agents of Nature, have been choosing mates who are wired to be helpful around the house, bypassing the other males of the species - who were left to handle the alternatively difficult job of enjoying themselves without the weight of responsibility. Furthermore, over the course of time these chosen males of the species will, it is theorized, reproduce at a greater rate thus producing more male offspring with these inherently helpful traits. And so it goes. If true, and just suspend reality for a moment and go with me on this one, the next time I am spending an evening at home feeling overwhelmed by endless loads of laundry and stacks of dishes (tonight), I can take comfort in the knowledge that I, Seattledad, am the end result of a process of Natural Selection that has been slowly taking place over eons. That I am one of the chosen ones. Yep, that should certainly take the edge off. That and a nice pot or two of hearty craft brewed ale. It might have been an elbow to the back. Or perhaps it was just a firm hand on my shoulder. It makes no difference, the result was my being startled out of what was, from the best I could recall, a comforting dream. There was muffled whimpering coming from Lukas' room. Only half awake, I ignored it, rolled back over, and immediately fell back to sleep. Then only moments later another cry, this time louder, woke me up once again. I glanced at the clock. Uhhg. I immediately got up and stumbled my way to his room. He lay there on his side, rubbing his eyes, but otherwise looked fine. "What's wrong buddy?" I managed to articulate through the fog. This was the second time that night I had been called to his room. "My feet!" he whimpered. "What about your feet Buddy? Do they hurt?" "My feet..........are sticking out of the covers!" "Cover them up daddy." I quickly pulled the covers over his socked feet, and without saying anything more, made my way back to bed. I didn't even bother to roll my eyes. Holy Rip the still beating heart out of my wintry pale Seattle chest and feed it piece by dripping piece to a voracious pack of bloodthirsty hyena's Batman, this parenting gig is H.A.R.D. The late night wakings? No I can handle those, but mostly in a Zombie like trance. The potty training? Not so much really. I don't normally brag about this but I have worked with a lot of poop in my life. Toddler tantrums due to hunger or lack of sleep? I can't say these don't exist, but the ones we do experience have been...um...tollerable. Not the horror stories I have heard and at times even witnessed. Plus, these are good practice for dealing with the likes of contractors and even certain co-worker types. The noticeable reduction in personal time and personal space? Hey, I became a first time dad at nearly 40 years of age. I've pretty much done a bit of everything. Plus, without a child I would just be sitting around waiting to die anyway. Alright, alright yes, of course I could use more time for me, as we all probably can. But honestly, that doesn't make parenting hard. No, what makes parenting so hard for this particular dad has to do with the concept of loving my kid too much. Can't be done, right? Yes, I agree. 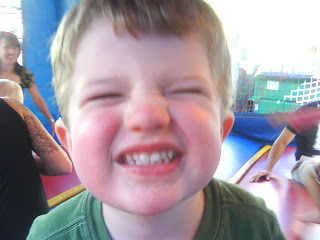 However, lately it seems that I have become so invested in my sons well being that it actually pains me more than ever to see him hurt, or upset, or even simply frustrated that he can't get his way. That life is not always fair. Specifically, I witness the desire within him to 'experience' life to its fullest at every moment. And when roadblocks are thrown up, roadblocks such as bedtime, meals, or learning to share it can be emotionally painful for him. And by proxy, me too. And the older he get the more it seems that I am highly tuned into this pain of his. That when he is in physical, or emotional pain I too am experiencing a palpable degree of my own. No, this doesn't mean that I, or Mrs. LIAYF, always give in and appease these feelings in order to make him feel better. Like all parents, we do this on occasion but those occasions are only exceptions. It is our duty as parents to strike a workable balance for him between experiencing life to the fullest, and growing up a strong, safe, happy, and healthy boy. And striking that balance correctly, means understandably tough decisions. It means not always giving Lukas that one thing which we know will make him happy in the moment. And that, to me, is the essence of what makes parenting H.A.R.D. But, as painful as it can be, it is still the best job in the world. I'm just hoping that the empathy pains diminish at least a bit as he becomes older. It was one of those rare Saturday mornings when Mom was away from the home, leaving Lukas and Daddy alone for some male bonding time. Since it WAS still morning, the boy and I opted to pass on cracking open PBR's in the garage while listening to heavy metal riffs, and reminiscing about past glory days. Perhaps another time (Er...yes, at least 20 years hence Mommy). Instead our plan was to attend a scheduled, and paid-for, morning Daddy and Me soccer class. However, being a one car family now, and with neither of us getting our act together enough to get out the door in time to catch the bus which would get us to the event on time, we had to settle for a hastily devised Plan B. This plan, which I must say was brilliantly conceived, had me, in essence, killing two birds with just one stone. I decided we would have a Backyard Adventure! And in this adventure I would have my 2 1/2 year old little guy 'help' me as I checked a few Honey Do's off of my standing list. This plan, to my surprise, worked out amazingly well! Lukas was thrilled to grab his shovel and dig up rose bushes, dig out the sand box, and shovel dirty bark into the yard waste container. We kept at it for nearly two hours, all on a soggy Seattle Saturday morning. Several puddles were also tested for splashability. He even crawled into the near full wheel barrow to examine how it was packing down since we needed room for additional sand. As you may have surmised from the previous paragraph, it was not too long before Lukas was a mucky mess of a child. 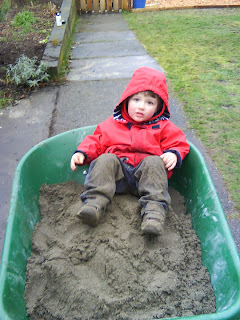 There were no worries though, as he was definitely having a blast helping out daddy with all the chores. Has anyone caught on the the delimma I was destined to face at some point during these 2 hours in the back yard? Has anyone? Bueller? At about the one and a half hour mark when Lukas indicated that he had to go potty. Unfortunately by this time he was already a dirty, soggy little mess and I really didn't feel like tracking that inside the house. It was then that I realized that since it was, as I mentioned, a male bonding morning, it was the perfect opportunity for Lukas to be introduced to a distinctly male rite of passage. His first nature whiz! I told him we were going to pee outside and pulled down his pants. "That's silly!" He exclaimed and he giggled wildly. "We are going to pee outside like the birds?" "Yes buddy, you are. It's o.k. once in a while." "Just don't mention it to Mommy when she comes back." So still sporting a big smile, he watered the grass. And with that Lukas took another step, albeit a small one, towards becoming a man. And oddly enough, I felt another small surge of pride.